We caught up with PopGym team member Grey to find out a bit more about this innovative organization in New York City. BFL: How did you get involved with Barrier Free Living (BFL)? PopGym: BFL reached out to us. 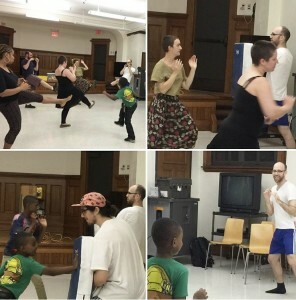 We are becoming more and more known for our self-defense workshops that we conduct all around NYC. We started organizing them about 1.5 years ago, and we have done over 100 since with all different types of folks. BFL: How does your class support our work with survivors of domestic violence? PopGym: The ethos of our class and our organization in general is to support folks who are looking for a means to better understand the options available to them regarding “self-defense”. Our workshops teach physical self-defense, but they also highlight the many different aspects of self-defense that are emotional as well. We try to build confidence in our attendees that no matter their personal situation, they have the ability and the right to defend themselves in whatever way works best for them. BFL: What is the importance of the type of class you teach in today’s world? PopGym: Our self-defense workshops are important because they allow for attendees, who might not have conceptualized themselves using their bodies in these way, to be able to try out these techniques in a supportive environment that would hopefully build the confidence to continue their own self-defense practice outside of the context of our workshops.